You’ve probably read about “Big Data” in the news. But do you know what it is? Hopefully this article will point you in the right direction! I like Wikipedia’s additional info, because they’re pointing out something really important about big data as a useful tool: the amount of data is important, but more important is what you do with those data sets. 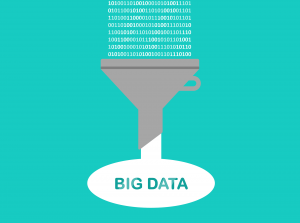 What can you do with Big Data? Healthcare issues. This article shares how a doctor was able to cure his wife of cancer by using the power of big data. Weather tracking. There are a lot of weather sensors deployed around the world that collect and share weather pattern data. This helps meteorologists have more accurate weather reports, and also helps give us early signs of larger natural disasters. Tracking customers. Coca-Cola is using big data to track customer retention. Uber’s surge pricing. Surge pricing is dynamic pricing that adjusts based on demand, mostly seen in busy urban areas (i.e., never in Topeka, KS). Privacy concerns. Somewhere in all that big data is something about me. Stuff maybe I want to keep private. That is not guaranteed in today’s online world. Security concerns. All that data out there … it can be hacked. Probably a host of other issues, too! GIS mapping. My library has used our patron database combines with GIS mapping to find out more about our customers, where our non-customers live, etc. We used that to increase library card holders. Buying better stuff. Or at least stuff that people want to check out. There are tools out there to help with that, including Collection HQ or Gale’s Analytics on Demand can help with that. Tracking other library-related analytics. Check out OrangeBoy, CIVICTechnologies, and Patron Point for starters. Washburn University example. Here’s an example from Topeka’s local university. The library used data to help improve student retention (and getting more students into the library).